Classification from Vaughan and Wells (1943) and Wells (1956), with additions after 1956. Those genera marked with a cross ( ) are known only from the fossil record, whereas the unmarked genera contain living and, in some cases, fossil species as well. Five "subfamilial" generic grouping are distinguished above, with the "type genus" of each group listed first. The caryophylliids are known from the early Jurassic (about 180 million years ago) to the Recent, and are ubiquitous in today's oceans, from coastal Antarctica to the Arctic Circle, and from shallow water to 2165 m. Of the genera listed above, the last 10 are zooxanthellate and most of them are also shallow-water reef-builders. 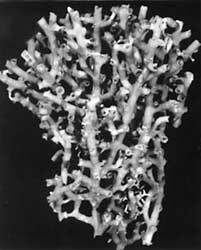 All of the other genera are, or are assumed to be, azooxanthellate, with one exception; however, at least four of those genera (Lophelia, Desmophyllum, Solenosmilia, and Goniocorella) produce the framework of deep-water coral banks at depths of 400-700 m (Cairns and Stanley, 1982, see figure below). The exception, Heterocyathus, contains species that are either zooxanthellate or azooxanthellate. Caryophylliids vary in size from a solitary corallum 4-5 mm in diameter (e.g., Caryophyllia rugosa) to large framework colonies of Solenosmilia, which may be a meter in diameter. This family represents an extremely diverse adaptive radiation, represented by 88 genera, 51 of them occurring in the Recent. Recent species number 296 (Cairns et al., 1999). Distribution of known deep-water azooxanthellate coral banks produced by caryophyllids in the genera Lophelia, Desmophyllum, Solenosmilia, and Goniocorella (after Stanley & Cairns, 1988, copyright © 2002 S. D. Cairns). Twenty-three (45%) of the 51 Recent genera are solitary in growth form, the remaining 28 genera being colonial. Twelve (24%) of the 50 genera are unattached (lying free on a soft or unconsolidated substrate), 36 are always attached to a hard substrate, and two genera contain species with both attached and free species. Whereas solitary species occur in the free and attached modes, all colonial species are attached. Two genera (Trochocyathus and Bourneotrochus) propagate by transverse division, and species of the genera Dasmosmilia and Aulocyathus most often reproduce by fragmentation. The species of one genus, Heterocyathus, have an obligate commensal relationship with a sipunculid; several genera are hosts for the galls of parasitic ascothoracidan Crustacea (Grygier and Zibrowius, 1985; Grygier, 1991); and one genus, Tethocyathus, is often the host of parasitic acrothoracican cirripeds (Cairns and Zibrowius, 1996). The coralla of the some of the solitary caryophylliids are among the most beautiful designs in Nature, usually displaying an hexameral septal symmetry common to Scleractinia, and some species further ornamented with 6 or 12 elongate spines, edge crests, or elaborate costae. However, some species display a pentameral, octameral, or even decameral septal symmetry. Left: Caryophyllia ambrosia: Calicular view of a skeleton collected from St. Christopher, Lesser Antilles (depth 622 m). Greater diameter of corallum 34 mm. This species represents caryophylliids having an unattached, solitary, cornute growth form, as well belonging to the first genus group. Copyright © 2002 S. D. Cairns. Right: Goniocorella dumosa: Skeleton of a colony collected from off Auckland Island, New Zealand (depth 421 m). Height of corallum 120 mm. This species represents those caryophylliids having an attached, colonial corallum, as well as belonging to the fourth genus group. Goniocorella dumosa is the predominant framework coral of deep-water coral banks in the temperate southwest Pacific Ocean. Photograph from Cairns, 1995, copyright © 1995 National Institute of Water & Atmospheric Research. The trabecular wall structure of every caryophylliid begins as a marginotheca, but transforms into a septo- or parathecal wall later in ontogeny, these more mature wall structures usually having well-developed costae (Stolarski, 1995). Occasionally nontrabecular calcium carbonate is deposited on the exterior of the corallum in the form of textura or even epitheca (e.g., Tethocyathus). Otherwise, the caryophylliids are extremely diverse in morphology, having a variety of palar shapes and configurations, columellar types, and corallum shapes All of these characters are used in the differentiation of the genera. 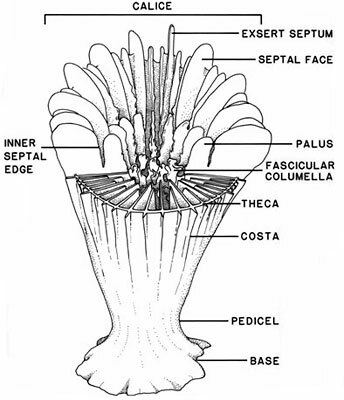 Cut away diagram of a specimen of Caryophyllia illustrating the basic morphological features of an attached, solitary scleractinian (from Cairns, 1994). Within the superfamily Caryophyllioidea, the caryophylliids are distinguished from the turbinoliids by having a corallum that is only partially invested with tissue, resulting in costae that are not as well developed as in the turbinoliids. No phylogenetic analysis has been performed on the caryophylliid genera, which, with 87 genera, constitute the most diverse family of Scleractinia. Recent molecular studies (Romano and Cairns, 2000) imply that the Caryophylliidae is an unnatural, or polyphyletic, family. Clearly, this is a family that needs both more descriptive and phylogenetic attention, but, because many of the species are small and occur in deep water, progress comes slowly. Vaughan and Wells (1943) and Wells (1956) divided the family into six subfamilies, and Chevalier (1987) treated the same group as seven distinct families. Cairns (1994) elevated the "subfamily" Turbinoliinae to the family level, but did not recognize the distinction of the other "families" or subfamilies. Likewise, Stolarski (1995) elevated the Thecocyathinae to family status. The five "subfamilial" generic groupings are distinguished in the list above, the "type genus" of each group listed first. Cairns, S. D. 1994. 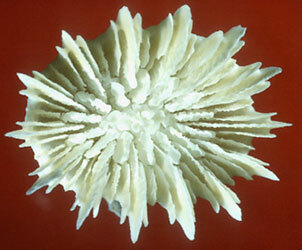 Scleractinia of the temperate North Pacific. Smithsonian Contributions to Zoology., 557: 150 pp. Cairns, S. D. 1995. The marine fauna of New Zealand: Scleractinia (Cnidaria: Anthozoa). New Zealand Oceanographic Institute Memoir, 103: 210 pp. Cairns, S. D., B. W. Hoeksema, and J. van der Land. 1999. Appendix: List of Extant Stony Corals. Atoll Research Bulletin, 459: 13-46. Cairns, S. D. and G. D. Stanley. 1982. Ahermatypic coral banks: living and fossil counterparts. Proceedings of the Fourth International Coral Reef Symposium, Manila (1981), 1: 611-618. Cairns, S. D. and H. Zibrowius. 1997. Cnidaria, Anthozoa: Azooxanthellate Scleractinia from the Philippine and Indonesian regions. Mémoires du Muséum National d'Histoire naturelle, 172: 27-243. Grygier, M. J. 1991. Introcornia (Crustacea: Ascothoracica: Petrarcidae) parasitic in an ahermatypic coral from Saint Paul Island, Indian Ocean. Vie Milieu, 40(4): 313-318. Stanley, G. D. and S. D. Cairns. 1988. Constructional azooxanthellate coral communities: an overview with implications for the fossil record. Palaios, 3: 233-242. Stolarski, J. 1995. Ontogenetic development of thecal structures in caryophylliine scleractinian corals. Acta Palaeontologica Polonica, 40: 19-44. Vaughan, T. W., and J. W. Wells. 1943. Revision of the suborders, families, and genera of the Scleractinia. Geological Society of America, Special Papers, 44: 363 pp. Wells, J. W. 1956. 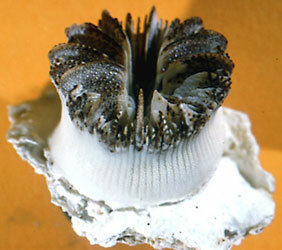 Scleractinia. Pp. F328-F444 in: Moore, R. C. (editor) Treatise on Invertebrate paleontology, Part F: Coelenterata. University of Kansas Press, Lawrence. Zibrowius, H. and M. J. Grygier. 1985. Diversity and range of scleractinian coral hosts of Ascothoracica (Crustacea: Maxillopoda). Annals de l'Institut Océanographique, Paris, 61(2): 115-138. A living colony covered with expanded tentacles. This species belongs to a group that consists exclusively of shallow water, zooxanthellate, reef corals. Creation of this page was supported by US National Science Foundation grants DEB95-21819 and DEB 99-78106 (in the program PEET - Partnerships to Enhance Expertise in Taxonomy) to Daphne G. Fautin, grant DEB99-78086 (in the program PEET) to Stephen D. Cairns, and grant OCE 00-03970 (in NOPP, the National Oceanographic Partnership Program) to D.G.F. and Robert W. Buddemeier. Technical assistance was rendered by Adorian Ardelean. The author welcomes the opportunity to identify specimens from this family, and offers to incorporate them into the collections of the National Museum of Natural History, Smithsonian, unless their return is requested. Page: Tree of Life Caryophylliidae Dana 1846. Authored by Stephen D. Cairns. The TEXT of this page is licensed under the Creative Commons Attribution-NonCommercial License - Version 3.0. Note that images and other media featured on this page are each governed by their own license, and they may or may not be available for reuse. Click on an image or a media link to access the media data window, which provides the relevant licensing information. For the general terms and conditions of ToL material reuse and redistribution, please see the Tree of Life Copyright Policies.